“I write this sitting in the kitchen sink” The opening line of my favourite book, “I Capture The Castle”. If you haven’t read it, you must. It’s like drinking a mug of hot chocolate while catching up with your best friend. It is comfort and sensory overwhelm and nostalgia for something half lived in another time. It also captures the essence of my childhood summers, a drowsy heady heat with a soundtrack of somnolent bees, exultant birdsong and the scent of bluebells resonating right to the back of your head. So when my favourite photographer Sally Sparrow asked me to provide wardrobe for a Summer photography workshop, I decided to a) start from scratch and create something new and b) base it around the moments of this wonderful book that typify an British summer in the countryside. Timeless, romantic, full of fleeting beauty and moments that no camera can preserve. I Capture The Castle has a magical scene where, following a dinner party, the guests decide to swim the moat around the castle ruins. They float through the silver moonlit water, while Handel’s “Water Music” drifts out of the windows above. I wanted to create a piece that held that sense of etheral freedom, of drifting, the light transforming the colours into misty otherwordly visions. It was also a chance to play with something I’ve wanted to create for some time- wings that seem to fold around the corset like a resting bird. As Cassandra prepares to see in the Solstice with her own “pagan” rites, she gathers wild flowers from the woods, including bluebells. My childhood home is at the base of a beautiful bluebell hill which becomes a haven of ambrosial scent for a few weeks a year. You don’t really notice the perfume of a bluebell until you walk amongst them in their masses, and suddenly, every breath becomes a delicate, sensuous worship of the season. The corset I created to capture this uses precious Sophie Hallette lace in a staggered pattern to play with a different way of creating an organic flow within the design. I wanted something at once vivid and hazy, already half a memory. “It seems to me now that the whole day was like an avenue leading to a home I had loved once but forgotten, the memory of which was coming back so dimly, so gradually, as I wandered along, that only when my home at last lay before me did I cry: “Now I know why I have been so happy!” Naturally there had to be a corset dedicated to the main character! 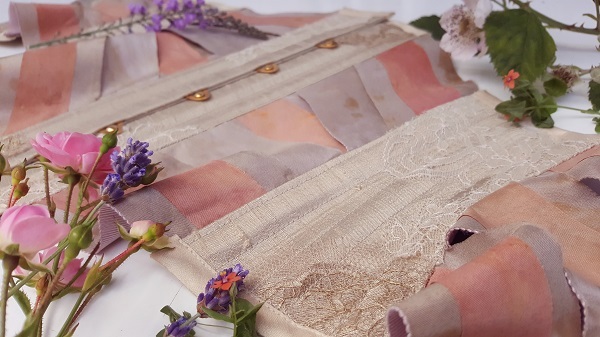 I used botanic print silks and layers of lace in blush, golds and neutral tones to capture something nostalgic, of another time, a corset for a nature loving English rose! Everyone is allowed at least two favourite characters in a novel, and Topaz is my second. An artist’s muse who stalks the hills naked to commune with nature. She is so affected in her manners, but at her heart is generous, fiercely loving and loyal. A corset that represented her had to be bold, striking, full of heart, I chose colours of golden yellow and smoky topaz, made with botanical print silk ribbons and green gold lace. Bohemian, decadent and full of flourish. I look forward to creating more photos with the corsets! Unfortunately I smashed my camera at the photoshoot so it may be a while till I can take any but these pieces will be available to hire! Or indeed, you could commission your own midsummer daydream! What would you choose to encapsulate the season?